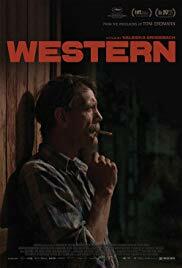 As in the genre from which the film takes its name, Western takes place in a borderland region that feels very far away from the ‘civilised’ world. A group of German construction workers building the foundations of a new power plant near a sleepy Bulgarian village in a sun-kissed valley, could easily be US cavalry officers on the Tex-Mex border tasked with making a staging post or fort, thus invading somebody else’s territory in doing so. The villagers, naturally, are a bit iffy about the interlopers and come off as standoffish and aloof. Some of the oldies remember the Nazis with a bizarre kind of fondness – they wore nice uniforms, were polite and courteous. In ironic comparison, the crew in town are boorish, ignorant, occasionally pester the local women and treat the Bulgarians like they’re dumb yokels always out to swindle the German workers. Many scenes, indeed the general shape of the narrative, hinge on moments involving subtle nuances in miscommunication or strained interactions and cultural barriers and differences. Among the workers is Meinhard. Inquisitive about people and charmed by the bucolic surroundings, he befriends the locals, earns their trust and in between work hours, Meinhard – a man with a face sculpted from granite, like he’s Jack Palance’s German cousin – likes to spend his downtime drinking with his new-found pals. Going native, so to speak, the middle-aged sad sack is looking for something elusive in his life, something to plug the hole in his heart and thinks he’s found it in rural Bulgaria. The villagers aren’t so sure. While he is sensitive to the antagonisms between his Bulgarian mates and suspicious work colleagues, Meinhard is guilty of romanticising village life and reads complex dynamics, interpersonal situations and scenarios too simplistically. Like most outsiders longing for acceptance among a community, he sometimes overcompensates. The elliptical editing, shallow focus cinematography, and slow burn mood make for perfect aesthetic counterpoints to the storytelling and accompanying themes. For while Grisebach’s often amusing use of western genre figures, tropes and themes brings a conceptual vividness and playfulness, it’s the film’s keen observations on male behaviour and displays of aggression and machismo, both individually and in groups, revealing truthful insights into the male mindset and body language, which provide Western with potent resonance.